1. I am blessed with anak yang takdelah susah sangat and takdelah senang sangat nak tidurkan dia.. tapi bila datang tantrum dia or perangai taknak tido memang boleh buat pening kepala and rasa nak marah je. 2. She started to test me when she was just days old. She refused to sleep alone, and even letak sekejap pun tak boleh. Always love to sleep dalam pelukan and nurse almost 24/7. So the idea of having a baby cot is impossible. I guess this condition is quite normal for new babies as they are still adjusting to the new world. 4. After the third months onward, Alhamdulillah dah tak nangis malam2. Tido pun lama dah malam2 and sekali dua je bangun untuk susu. Mummy had longer sleeps Alhamdulillah. 5. After enjoying good rest and enough sleep time, the time of berjaga malam started again when she just learned to walk ( for record : Amna started to walk at 1 yr 2 mo). Malam2 pun nak berjalan, keluar masuk bilik. The best part is dia taknak berjalan sorang2, she took Mummy's hand to teman dia berjalan2. 6. Pastu bila dah start main (umur around 1 yr 3 mo), tidur makin lambat. Bila tidur lambat, bangun pun lambat, kul 12noon kadang2. Then tahan mata main2 lagi taknak tido.. tunggu Mummy balik office then terus ajak masuk bilik to nurse and sleep. This is usually around 6.30pm.. then tido la dia sampai 8.00pm. Kemudian bila bangun energetic macam baru bangun pagi plak so the ritual goes on and on.. sometimes tido kul 2.30am!! 7. These few days were the most challenging for me. My inlaws balik kampong so I need to ask for my parents favour to look after Amna. And this means I need to commute to work from Seremban. Kemudian, datangla perangai dari mana tah dia dapat, pandai merajuk then bila ade benda tak kena sikit mulalah dia melalak and scream at top of her lungs. Contoh kita tutup satu lampu sebab nak tido pun bole jadi sebab. For me, this new experience memang memeningkan. Sebabnya, I am commuting and need to get ready as early as 5.30am. Kalau kul 3am pun belum tido lagi, abis camaner……. 8. Satu malam yang sangat horror adelah on last 2 nights where Amna dah ngantuk ptg tu but Atuk dia refused to let her sleep, kononnya malam nnti dia boleh tido terus sampai pagi. End up she slept at 9.30pm (after a half an hour tantrum) and woke up at 11.30pm just when I crept beside her to sleep -_- And kalau dah bangun tu.. tau jerlah. Again she refused to play alone, semua ambik tangan Mummy soh ikut and play with her. Bila dah kul 3am, my brain dah cannot fully function. Luckily my Mom let me sleep and she teman my daughter to watch her video. Tetapi at about 4.20am, she felt sleepy and when she saw me sleeping (alone), she screamed and cried agaknye sebab tengok I tak ambik dia tido sekali. I don't really know what time she fell asleep, but what I know is I terpaksa amik half day to work as no way I can wake up at 5.30am and catch the morning bus. 9. I hope her new habit is just a phase and it would, and NEED to subside sooner before I lose my insanity. I seeked guidance from other parents about this, and tried to implemented their tips, so far none worked! Tried to wake her up early in the morning, and not letting her to nap at night before her sleep time, tried to switch of the lights. None worked. Perhaps I need to try harder. 10. 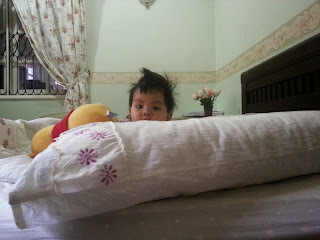 I don't want to train my anak to sleep at 8 pm coz I am working during the day and I want to spend more time with her. I think sleeping at 10pm would be ideal.. however it's not easy to achieve it realistically… I will continue my research to reset my anak's body clock so we can ensure a happy child and happy Mommy at the same time.